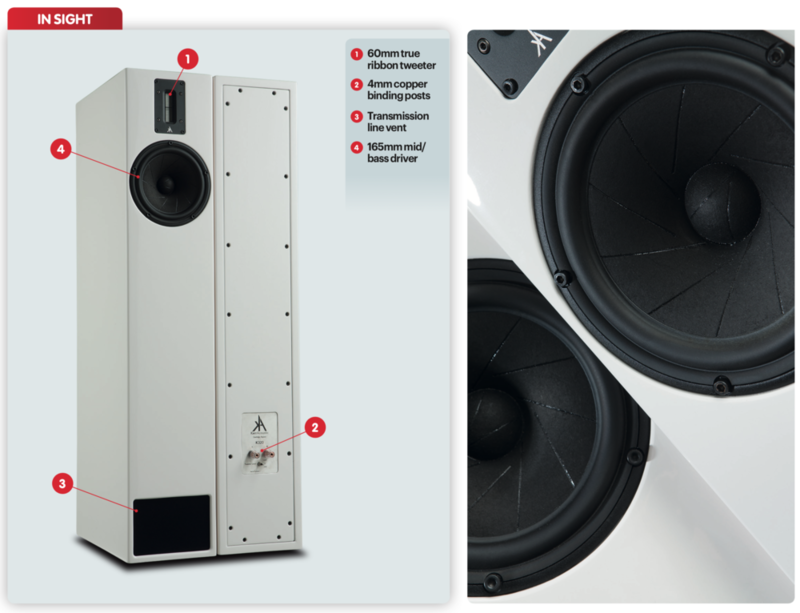 "David Price thinks Kerr Acoustic's new transmission line K320 floorstander is a really serious performer"
There is no single correct way to design a box loudspeaker and yet so many people end up with reflex-ported cabinets. These generally offer the best bang for your buck, being straightforward to design, inexpensive to make and a relatively easy going drive for the partnering amplifier. Trouble is, reflex loading often results in a non-linear bass response; less well-designed examples impart a ‘one-note’ bass sound as the port kicks in, smearing transients and giving a rather cushioned sound. That’s why Jes Kerr – former professional drummer, music producer and now founder and designer of Kerr Acoustic – likes transmission line loading so much. “With transmission lines it is easier to distinguish the detail and nuances in individual instruments in the lower octaves”, he says. “Take double bass and tympani playing together for example; with a reflex enclosure, these sounds are more likely to merge together, with the cabinet and port’s natural resonance being excited and colouring/smearing the presentation.” If properly done, transmission line designs give a faster, deeper bass for a given cabinet size and lower distortion, too. The reason that TLs aren’t as popular as reflex designs is they’re harder to get right, costlier to build and tend to be less efficient. A modern 165mm Scanspeak 18W/4531G01 mid/bass driver with a wood-fibre cone is used, and the tweeter is a modified Fountek Neo X 2.0; it’s a 60mm true-ribbon design with a very low 0.027g diaphragm mass. These are laced together at 1.95kHz with a six-element, second order (12dB/octave) crossover with selected components, hand soldered using point-to-point wiring. Unique air-core inductors, hand wound in-house, are used, along with polypropylene film capacitors and carbon film resistors. Claimed frequency response is 24Hz to 45kHz, sensitivity 90dB and nominal impedance 6ohm. Around the back is a pair of 4mm pure copper binding posts and a treble level cut switch. This excellent compact floorstander far exceeds expectations for a product at this price – indeed it even has a touch of the exotic that its price rivals lack. Rush’s The Camera Eye is a torture track for any loudspeaker, with its three-dimensional soundstage, amazingly fast and propulsive bass guitar work and firecracker drums. The K320 loves it, showing just how impressive a well-done transmission line design can sound. The bottom end is so tight and taut that you can hear how Geddy Lee’s bass guitar sounds just as percussive as the drum kit. The bottom end is deep and strong, yet eerily well controlled. Surprisingly, the stellar bass is not in my view the best facet of its character. At the other end of the frequency band, the ribbon tweeter delivers a delicately etched performance that’s full of filigree detail. Supertramp’s Bloody Well Right has some beautiful hi-hat cymbal work, with each strike tailing off into an inky blackness as the next arrives with its lightning- fast ‘clink’. The K320 delivers this perfectly, letting high frequencies shimmer with a lovely metallic sheen without ever becoming tonally harsh or texturally coarse. Instead, the music takes on a deliciously dextrous yet floaty feel that makes the song an absolute pleasure to play. In the presence region, things continue to sound great. It’s clear how the K320 reaps the benefit of that high-quality tweeter, showing a delicacy and vibrancy to the sound that’s often lost by clumsy fabric domes, and/or lesser mid/bass units. Things are pleasingly neutral, if not quite translucent. My aged copy of Wrapped Around Your Finger by The Police comes across in a most impressive light. You can peer right into the mix and get a great feel for the recorded acoustic. Things are marked out in space with great accuracy, and the stereo image is satisfying wide – if not quite as cavernous as a true high-end offering. For me, what absolutely defines this design is its combination of speed and smoothness. The super-light tweeter, allied to its ultra-tight bass and highly inert midband, make it great fun with fast, propulsive music. Kraftwerk’s Die Roboter sounds smooth and sophisticated yet hugely engaging. This speaker’s transient speed is excellent, and every type of music it touches sounds highly involving, vibrant and alive. The great thing is that everything ties in perfectly together; there’s no sense of the treble being ahead of the bass or of either driver interfering with the other to cloud the midband. Instead, it presents a cohesive single object in space and time, which is just what a great loudspeaker should do. Given the price and its enormous ability, it is almost churlish to criticise – but no speaker is perfect, including this one. In absolute terms the K320 doesn’t quite have the sense of effortlessness that you get from larger three-way high-end designs. All this shows us is that the Kerr is – like everything else – not immune to the laws of physics. Truly free-flowing loudspeakers need wide baffles, big drivers and deep boxes with far more air inside to really breathe. As one of the most impressive upmarket floorstanders I’ve heard in a long time, the K320 is a great advert for transmission line loudspeaker designs. Just remember to partner it with a muscular solid-state amplifier and decent source to enable it to deliver its very best.